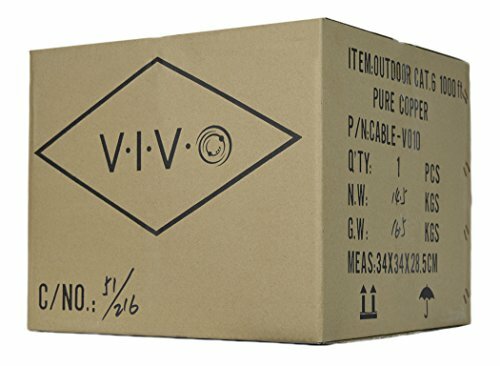 Cat6 UTP (unshielded twisted pair) PURE COPPER 23 AWG bulk ethernet cable in easy to use pull box is ideal for your network installation. Case contains 1,000 ft of wire in waterproof shielding for outdoor direct burial. Category 6 cable, commonly referred to as Cat6, is a cable standard for Gigabit Ethernet and other network protocols. This cable provides performance of up to 550 MHz and is suitable for 10BASE-T, 100BASE-TX (Fast Ethernet), 1000BASE-T / 1000BASE-TX (Gigabit Ethernet) and 10GBASE-T (10-Gigabit Ethernet). This unshielded cable comes in its own spool box and is connector free, giving the user the freedom to customize the length, wiring, and application.